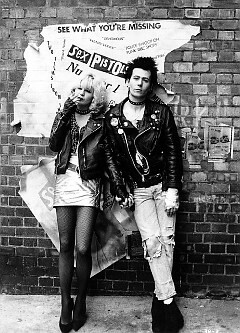 Nancy Spungen and Sid Vicious. . Wallpaper and background images in the 英年早逝的明星 club tagged: celebrities who died young musician. This 英年早逝的明星 photo contains hip boot and thigh boot. There might also be 袜子, 软管, 裸露的双腿, 连裤袜, 紧身短裤, 紧身, 裸腿, 短裤, 短裙, 紧身的紧身裤, 街道, 城市风貌, 城市环境, 城市场景, and 城市设置.